Just a couple of months after the launch of the CLA in India, Mercedes-Benz is back with the new GLA hitting showrooms at Rs 69.6 lakh ex-Mumbai. This makes the car approximately two lakh dearer than its sedan equivalent. Similar to most AMG cars in the country, the GLA 45 AMG retains its body structure from the base GLA crossover but with the AMG treatment. It gets new bumpers with aggressive looking air intakes as well as a lip spoiler. 19-inch alloy wheels which expose the red AMG calipers, a sporty diffuser and quad AMG exhausts complete the side and rear profile. Not to mention the red and black stripes running along the sides of the car. The sporty theme is carried over into the interior as well with a sporty AMG gear selector and flat bottom steering wheel. There is also adequate cabin room for four people. The Mercedes-Benz GLA 45 AMG gets the same 2.0-litre four-cylinder turbo petrol seen in the CLA 45. It makes 360PS of power and 450Nm of torque. This turbo petrol engine transfers power to all the four wheels via a seven-speed dual-clutch transmission. Mercedes offers a performance exhaust as standard on the new GLA 45 AMG. 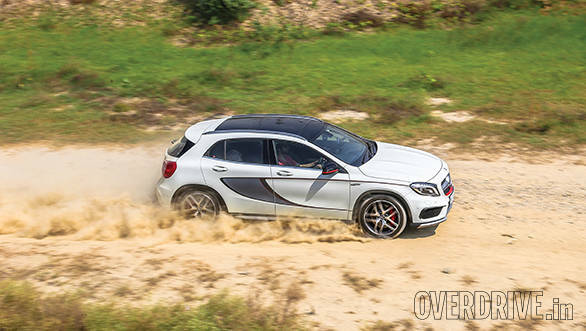 In our tests, the AMG crossover recorded a 5.6s run to 100kmph. In city the car returned close to 8kmpl while on the open highway, the figure rose to 11kmpl. Not bad for a performance oriented car. Goodbye resting heart Rate: Dynamic spirit with invigorating Performance, Mercedes-Benz GLA 45 AMG 4MATIC drives into India · GLA 45 AMG 4MATIC comes power packed with the 'most powerful 2 litre four-cylinder series production engine in the world' · AMG performance 4MATIC coupled with AMG SPEEDSHIFT DCT 7-speed sports transmission and AMG sports suspension provides the unmistakable hallmark AMG driving experience · GLA 45 AMG 4MATIC is the eighth member of the Performance Brand's India portfolio and Mercedes-Benz India's ninth product for 2014 · Expressive AMG exterior design for an athletic touch; 48.26 cm R19 AMG 5-spoke alloys painted in titanium grey · AMG Performance exhaust system with variably adjustable exhaust flaps: Further enhances the sound quality · Equipped with the performance-oriented AMG 4MATIC all-wheel drive as standard the GLA 45 AMG 4MATIC provides an ideal combination of dynamism, traction and efficiency · Styling, Dynamics and Independence  traits that are perfectly embodied in the new high-performance SUV, captures the imagination of trend-oriented customers · Mercedes-Benz won it's first-ever F1 Constructor's Championship: testimony of AMG's next-generation engineering skills, on a fiercely competitive world stage Mumbai: Mercedes-Benz India continued its product offensive with rigour by launching its ninth product in 2014, the new GLA 45 AMG 4MATIC in India. Combination of powerful-distinctive design, exclusive appointments as well as superior engine power and driving performance, the GLA 45 AMG 4MATIC makes a strong statement in the growing luxury SUV segment. With the most powerful series-production four-cylinder engine in the world, the new GLA 45 AMG 4MATIC high-performance SUV also shines with low emission and fuel consumption figures. GLA 45 AMG 4MATIC, the newest member of the AMG Performance Brand was launched in India by Eberhard Kern, Managing Director & CEO, Mercedes-Benz India at Mumbai, today. Eberhard Kern, Managing Director & CEO, Mercedes-Benz India commented, "The GLA 45 AMG 4MATIC is into a league of its own and provides an overwhelming driving experience. With its powerful-distinctive design, exclusive appointments as well as unrivalled engine power and performance  the new GLA 45 AMG 4MATIC is a true all-rounder. The unique product characteristics and the individualization options allow us to attract new target groups. With the launch of this high-performance SUV, Mercedes-Benz makes a strong statement in the fast growing performance SUV segment in India." "Mercedes-Benz won it's first-ever World Constructor's Championship in Formula One demonstrating the technical prowess of AMG in developing the most powerful and most efficient Hybrid Power Unit. Every AMG car inherits this technical superiority, be it the F1 race car or the series production car meant for the customers. The AMG brand is now a popular name in India and represents the AMG pledge of 'driving performance' like never before. With the launch of the GLA 45 AMG 4MATIC, we bring AMG's superior performance tenets to India and further reinforce the robust AMG portfolio. The fourth AMG product to be launched in 2014, the GLA 45 AMG 4MATIC is a perfect fit for the performance SUV enthusiasts who wants a fresh perspective in terms of performance, combined with styling, design and luxury. With the latest and fascinating AMG product line-up, strongly supported by the expanding AMG Performance Centres; we are well poised for the next phase of expansion for the AMG brand in India." Mr. Kern further added. Driving Performance: The GLA 45 AMG 4MATIC will be for 4x4 enthusiasts, who love extreme performance. The power output peaks at 132.5 kW per litre of displacement. This is higher power density per cylinder than any other car in the world. A maximum output of 265 kW and up to 450 Nm of torque are unmatched by any other mass-produced turbocharged four-cylinder engine worldwide. The high output and torque coupled with the performance-oriented AMG 4MATIC all-wheel drive fitted as standard lead to an adrenalin rush when driving the GLA 45 AMG 4MATIC. The GLA 45 AMG 4MATIC completes the sprint from 0 to 100 km/h in 4.8 seconds and has a top speed of 250 km/h (electronically limited). The AMG SPEEDSHIFT DCT 7- speed sports transmission in the GLA 45 AMG 4MATIC features three distinct transmission modes, a double-declutching function dependent on the transmission mode and a RACE START function for optimum acceleration. The strengths of the dual-clutch transmission include spontaneous gear shifts without loss of tractive power, a tailor-made control strategy based on the AMG SPEEDSHIFT functions, extremely smooth gear shifts, and a high level of efficiency. The GLA 45 AMG 4MATIC comes with variable AMG Performance 4MATIC all-wheel drive as standard. In developing this all-wheel-drive system, the focus was firmly on performance and dynamic spirit. The all-wheel-drive system provides an ideal transfer of engine power to the road to provide perfect traction  regardless of the weather conditions. It also elevates driving dynamics to the highest level. The 4MATIC control unit evaluates all the data required for driving dynamics and traction to calculate the ideal torque distribution. The AMG Performance 4MATIC comes with 4ETS for driving safety and agility. The 4ETS dynamic handling control system improves start-off and acceleration on road surfaces offering varying grip on slippery roads. 4ETS prevents one-sided wheel spin when moving off or accelerating. Exterior styling and design: The GLA 45 AMG 4MATIC boasts the expressive AMG design, which lends the sporty GLA-Class an athletic touch and reinforces the dynamic impression. The design of the GLA 45 AMG 4MATIC exudes fascination on account of its powerful and distinctive character. As the powerful AMG top-of-the-line model of the GLA class, the high-performance SUV combines the hallmark sensual clarity of Mercedes-Benz as an expression of modern luxury with muscular elements exclusive to AMG. The AMG front apron with front splitter and the AMG "twin blade" radiator grille provide athletic highlights  both are painted matt titanium grey. Completely new: the distinctive AMG lettering at the side between the louvres of the radiator grille. This will make all new AMG models easy to recognize in future. An impressive front face is ensured by the headlamps and standard LED daytime running lamps. The AMG-specific rear end design elements include AMG rear apron in diffuser look with matt titanium grey trim, AMG Performance exhaust system with two chrome-plated tailpipe trim elements featuring a twin-pipe design integrated into the bumper and '4MATIC' along with 'GLA 45 AMG'. The large roof spoiler in bucket tooth design is another eye catching feature. It accommodates the third brake light and gives the exterior of the GLA 45 AMG an even sportier touch from the rear. When viewed from the side, the distinctive 48.26 cm R19 AMG light-alloy wheels catch the eye. The side sill panels with matt titanium grey inserts, the 'TURBO AMG' lettering on the front wings and the aluminium roof rails lend the GLA 45 AMG 4MATIC a special touch. Sporty interiors: As in all AMG high-performance vehicles, the interior of the GLA 45 AMG 4MATIC delights with its high-quality appeal combined with sporty flair and exclusive equipment features. The 3-spoke nappa leather multifunction AMG Performance steering wheel with red contrasting topstitching and AMG aluminum steering-wheel shift paddles allows for perfect vehicle control. The AMG instrument cluster with 2-tube design and free-standing 17.8 cm Central Media Display, AMG main menu and the RACETIMER which enables lap times to be measured and stored so as to provide information to the driver. AMG Performance seats with red contrasting topstitching and red designo safety belts are on board, as is the AMG DRIVE UNIT. On opening the door, the driver is greeted by the AMG start-up screen in central display. The trim of the instrument panel is of brushed aluminium and, in tandem with the brushed stainless-steel AMG front door sills, emphasizing the high-grade, exclusive ambiance inside the GLA 45 AMG 4MATIC. With its large glazed areas, the Panoramic Sunroof ensures a particularly bright and welcoming ambience in the interior of the GLA 45 AMG 4MATIC making especially the rear more spacious. Features like illuminated door sill panels with 'AMG' lettering and Ambient lighting make the interior classier and lends the it an even more luxurious atmosphere. The windscreen wipers with rain sensor enhance comfort and optimum visibility. The car offers intuitive equipment operation with COMAND Online which is equipped with a hard-disc navigation system featuring a map display along with a DVD player, radio and 10GB memory for compressed audio files and Speed Limit Assist to display speed limits in the instrument cluster. The ease of operation is further enhanced with Active Parking Assist which makes it easier when searching for a parking space and when entering or leaving parallel or end-on parking spaces. The system automatically steers the vehicle into parking spaces, taking the steering and braking work off the driver. The wealth of Safety features: Keeping in line with the Mercedes-Benz tradition of safest cars, the GLA 45 AMG 4MATIC is available with numerous high-quality assistance and safety systems which support drivers and reduce their workload. Typically for AMG, the Electronic Stability Program is configured as a three-stage ESP®. The three modes 'ESP ON', 'SPORT Handling Mode' and 'ESP OFF' enable the driver to vary dynamic performance according to individual requirements at the push of a button. As a result, the GLA 45 AMG 4MATIC steers precisely and under control at all times. ATTENTION ASSIST can detect typical symptoms of drowsiness on the basis of driver behaviour and alert the driver to increasing fatigue and inattention. This system can improve driving safety, especially on long journeys and at night. PRE-SAFE system is able to recognize critical driving situations as they develop, and initiate preventive occupant protection measures if an accident threatens. These include reversible belt tensioning or automatic closing of open side windows, complete closure of the panoramic sunroof and bringing the front driver and passenger seats into a more favourable position before crash. The car also comes with seven airbags as standard. The AMG DNA: One of the keys to agile handling is the axle technology: for enhanced driving dynamics, the McPherson front axle on the GLA 45 AMG 4MATIC is fitted with stiffer steering knuckles and new elastokinematics. The AMG sports suspension with specially tuned spring/damper units and bigger anti-roll bars provides high lateral acceleration and reduced body roll in fast double bends. The hallmark Mercedes comfort on long journeys is ensured all the time. The AMG high-performance braking system with internally ventilated and perforated disc brake offers excellent deceleration performance and precision brake control. The AMG Performance exhaust system also features a large pipe diameter for minimized exhaust gas back pressure and optimized performance. When adopting a sporty style of driving drivers of the GLA 45 AMG will experience an emotional sound, which will give them a true race track feeling. In addition to the CLA 45 AMG, the GLA 45 AMG 4MATIC is the second vehicle with four-cylinder turbo engine to appeal to a young target group. The trend-oriented customers set great store by styling, dynamics and independence  traits that are perfectly embodied in the new high-performance SUV. Meeting a wide variety of customer desires has always been one of the strengths of Mercedes-AMG. The GLA 45 AMG now expands the extensive SUV line-up to five models (GLA 45 AMG, ML 63 AMG, GL 63 AMG, and G 63 AMG). Mercedes-AMG thus offers the widest range of SUVs among all high-performance premium brands. The GLA 45 AMG 4MATIC is priced at Rs. 69.60 lakhs ex-showroom Mumbai and will be available for sale at all Mercedes-Benz India dealerships across India.